Defrost the chicken tenderloins if necessary. In a shallow dish, beat the egg and add in the water and salt. In another shallow bowl, pour in the sweetened coconut. Dip the chicken in the egg, then in the coconut. Press to coat and set aside. In a large, ovenproof skillet, heat the oil over medium-high heat. Transfer the skillet to the oven and bake until cooked through, about 12 minutes. 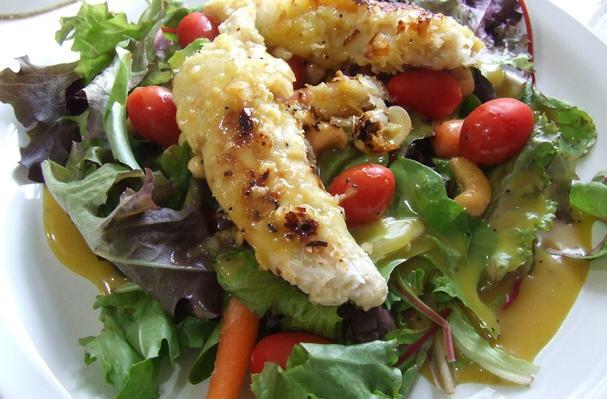 Serve the chicken on top of a salad with tomatoes, cashews, onion, and whatever else your heart desires. For the dressing–just whisk all the ingredients in a medium-sized dish. Then, drizzle the sweet honey mustard dressing on top and gobble up!